Some people have had questions regarding what it’s like for us to be living in a hotel. If something like a Holiday Inn or Hampton Inn or Quality Inn in the U.S. is pictured, the picture will be somewhat distorted. I would guess that the hotel sits on four to five acres. Most of the open space (what I would call the front yard, courtyard, and back yard) is planted in flowers, flowering shrubs, and flowering trees. Yes, there are colorful flowers everywhere. The view from our room is of the “backyard”. 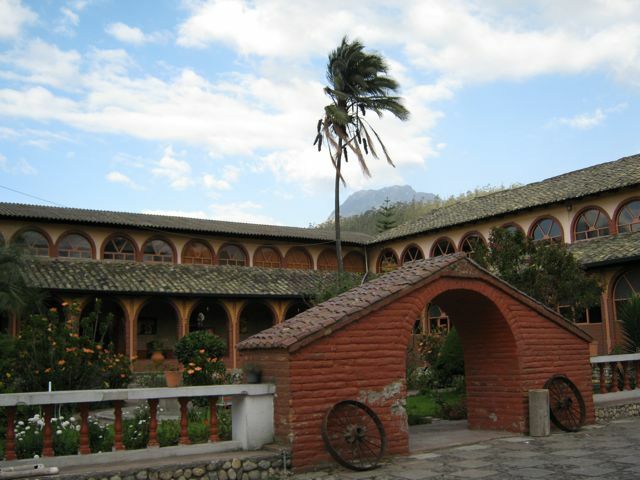 Imbabura Volcano, 15,160 feet high can also be seen from our window looming above the roof of another wing of the hotel. Sometimes there are horses in the “back yard”, which are normally kept on another piece of the property. As far as we can tell, they are used to mow the grass. I can’t figure out why they don’t eat the flowers, except that the grass tastes better. Between renting an apartment and living here, we feel this is the better choice from an immersion point of view. None of the hotel staff speaks English, so we need to speak Spanish with them anytime we interact. We have to interact a minimum of three times a day (mealtimes) but we always do so more often than that. True, both apartments we looked at had Spanish-speaking neighbors with whom we could have probably practiced, but, because we would have prepared most meals in the apartment, we wouldn’t have been forced to interact as much. Here, I believe we interact even more than we did at our home stay at the Spanish immersion class we attended in February in Cuernavaca, Mexico (not counting the lessons themselves, of course). It’s a very good situation. Besides having the staff to talk to, there have also been guests, many of whom have been very interesting. We’ve met people who have spoken Spanish, spoken French, and spoken English. 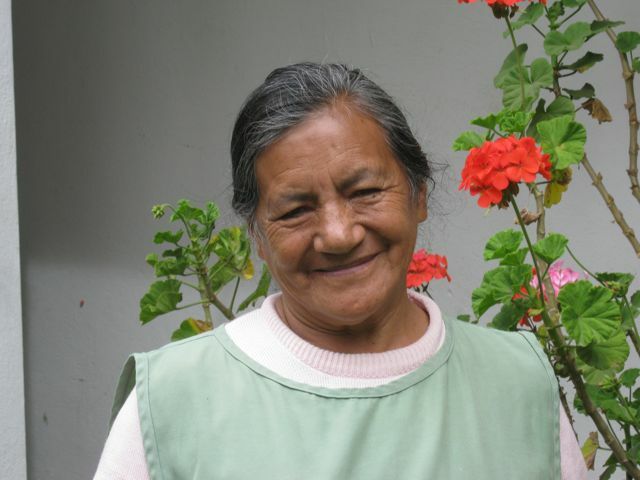 One woman, who is indigenous, stays here about every other weekend because it is then that she teaches extension classes in Otavalo for the University of Ibarra. We met one couple from Quebec Province in Canada volunteering for three weeks with Rotary International. They had been working on water projects, affordable housing, and childcare centers. Last weekend, we met a family from Quito. 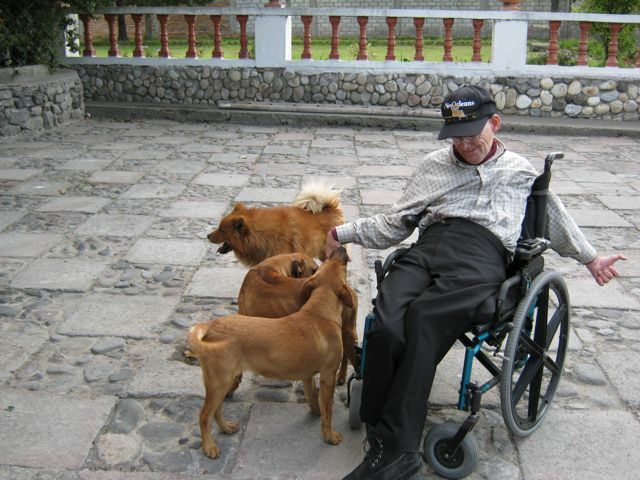 He was from Chicago, but had been living in Quito for eight years. She was from Ecuador. Their five-year-old daughter was perfectly bi-lingual. They own a bookstore in Quito and sell English language books. If you’re ever in Quito, look up Confederate Books. 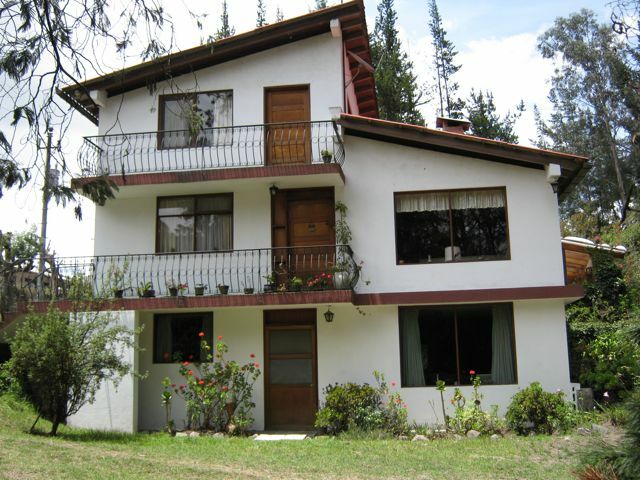 Staying at the Ally Micuy is not as good a situation economically as living in an apartment, but it’s not beyond the overall budget we put together before coming to Ecuador. We were able to negotiate a flat monthly rate, which is only slightly higher than living in an apartment when one considers the costs of groceries and utilities. In exchange for our monthly rent, we get a pretty spacious room and bath, three meals a day, cleaning twice a week, laundry privileges, and a safe place to park our car. Because Marilyn doesn’t have to prepare meals, it saves time. (Of course, not cooking is a two-edged sword for someone like Marilyn, who enjoys cooking. When there are large groups here on the weekends, she often gets to fulfill her desire to cook by volunteering to help in the kitchen, and that also helps her Spanish.) The menu here is pretty varied, though the variety is not as high as it would be in our own home. The food served is very good and tasty. They have experience cooking for foreigners, so we don’t have to worry about what we should or should not eat. In addition, if we tell them we’d like something different (oatmeal at breakfast or more beans at dinner, for example), we need only to ask in advance, and they will prepare it if possible. The staff here, eleven that I can think of, are all very nice to us, and go the extra mile to help us. They have not minded talking to us in our emerging Spanish. They have helped us find a car. They have helped us get that car fixed. They have helped us open a bank account. They have recommended a Spanish school for Marilyn. They have told us where to find the lowest prices on things. They have helped me get a table made to my specifications so I could write these blog posts in comfort. They have given us personal cell numbers in case we have needed help or gotten sick. In short, they’ve been a godsend, making our lives much easier than they would have been if we had had to figure out all of these things on our own. There are few guests here during the week (most guests come on weekends), so it does not feel like we’re the couple in Room 104 surrounded by people who come and go. In fact, it feels like living with an extended family. This feeling is intensified because there are two family groups (with children) who live here as well as work here. That gives us a greater sense of safety, lessens the sense of loneliness associated with being away from our family and friends, and provides a neighborhood feeling. There are even three dogs here for us to pet. We didn’t know exactly what to expect when we came to Ecuador por un año (for one year), but we feel very fortunate not to have ended up in an impersonal and sterile environment. Of course, having come to know the Ecuadorian people, even on the surface, we felt there was little chance of that happening. Yesterday Marilyn sat with the madre of Isabel, one of the staff here. Isabel’s madre has cancer and she took a turn for the worse over the weekend. They tried to get her into the hospital, but there were no beds available, so she remained at home. Isabel doesn’t like to leave her alone, but she had to come to work. So Marilyn volunteered to sit for a while. Marilyn was just doing what she would do for our own family and friends – care, and offer help. This has been a week filled with “car”: Looking for a car, finding a car, taking the car to a mechanic to see if he thought it might be a good car, finding out that it needed repairs (actually, we expected that), then negotiating a price to buy it at the patio de coches. After that it went first to the general mechanic for a tune-up, then back again to check the brakes, and then to the electrician who fixed it when it wouldn’t start. In addition, the ANETA class of driving lessons started for a month of driving and theory. Driving isn’t a problem for me, but learning the laws in Spanish gives me a lot of homework. The mechanics here work for what seems like very little money to me. The tune-up cost us $30 plus another $25 in parts (spark plugs, new belt, gas filter). The mechanic worked for at least 2 to 3 hours. Here, the car owner is responsible for getting the parts. Jairo and I walked to two different parts stores for what we needed. We still need an odd sized air filter that was put on order and should arrive this coming week. The brakes were $40 (this I did on my own without Jairo’s presence). The electrician cost $10 and Jairo took care of this. I like to think I can make it on my own. But you can imagine how helpless I felt when the car wouldn’t start and there was no AAA to call for a tow job. The staff here at the hotel called Jairo and he came to my rescue. He went to pick up the mechanic who tinkered with the car until he got it running, then Jairo loaned his car to me while he took my car to the electrician. All of this kept me very busy, but the really exciting news is that I now have a job scheduled! Blanca came on Friday (which was when the car wouldn’t start) and with Jairo’s car we drove to Huaycopungo (about 3 miles out of Otavalo). 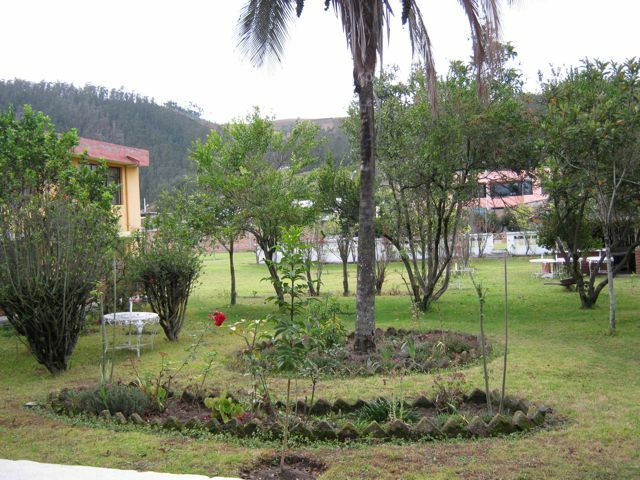 This community is home to the church where I first worked in Ecuador on a mission trip 10 years ago. The church has a forward thinking pastor who has built this church from a small congregation into a congregation that fills their large worship area and has a large activity center that is kept busy with activities. The mission trip 10 years ago worked on the first floor of what is now the four story activity center. They are hoping to expand their small kitchen to at least double the size so the many times they feed people, there is enough room to cook food for everyone more easily. The pastor has made a big difference in organizing this community. When Blanca offered English lessons taught by someone who speaks the language but who is not a foreign language instructor (that is, me), and even when it was explained that learning a foreign language is a poco a poco project for learners, not something that is going to happen in a short span of time, he was for it. It was decided that I would teach 3 hours a week for a total of 30 hours to begin with. FEDICE would provide a “diploma” and me (and maybe a white board). So classes will begin the Monday after my driving classes end, the middle of April. I am fortunate to already have received some ideas from both Blanca and Jane Perrine, who lives in Cedar Park, TX, about what to teach a class of 30 students, 13 year olds to young adult age, who want to learn some English, but don’t have any experience with the language yet. At least the students will all begin at the same level. And, I am hoping with God’s help I can lead helpful and fun classes that will keep participants interested. Before this trip to Ecuador, I had learned that one cannot always be as independent as we North Americans want to be. Utilizing others’ help and asking for assistance is not a bad thing. I feel like the people here have been more than willing to help me in my times of need. It is a good feeling to be able to reciprocate in some small ways, or at least to pass on, pass forward the love I’ve been given. 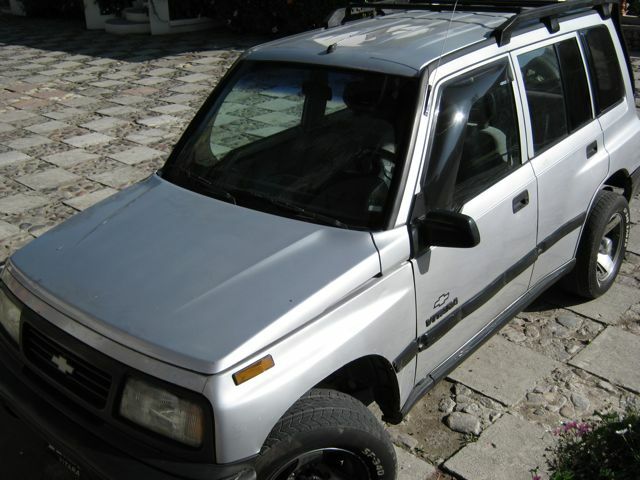 Meet Molly, a 1994 Chevrolet Vitara 4x4. Yesterday, the reflection that I get from UCC everyday talked about forcing oneself to move on and keep trying even in times of frustration, depression, lack of success. This morning, I woke up feeling rather overwhelmed by our need to get a car but our seeming inability to find the right one. Of course, Glenn is always supportive, but it was hard to get up for the day. Thinking about the reflection, I prayed for help in keeping motivated and help for finding the right car within our budget. During breakfast, out of the blue, Jairo (the hotel's manager) asked us how things were going and I expressed frustration with our inability to make a decision about the car I found two weeks ago that Victor said is too old and too expensive. After going to Tocagón yesterday, I was reminded how important good wheels are for the cobblestone and dirt roads going up into the indigenous communities. And a four wheel drive isn’t a bad thing to have either. So I was beginning to feel the VW Venta sedan wasn’t necessarily a good choice for what we needed. Jairo rearranged his schedule and took us along on an errand to Ibarra. On the way back, he spent around 2 hours stopping at different patio de coches (used car lots) so we could look at used cars. We found cars we could afford older than the Venta (it's a 1994) that looked like they were beginning to fall apart; we found high clearance vehicles that had low enough seats for Glenn, but were out of our price range; and then, nearly out of time, we found a four wheel drive that is as old as the Venta with fewer miles (still near 100,000 miles) but within our price range. Jairo said the motor looked good and we’re taking it to a mechanic tomorrow. Wow! I felt humbled and thankful for the gift Jairo gave us of his time and patience. AND, if we really do get the 4 x 4, Glenn may never want to come back to the US. He has wanted a jeep for years so he could go on the back roads. He may actually get his wish and there are definitely lots of amazing mountains here that have unpaved roads! 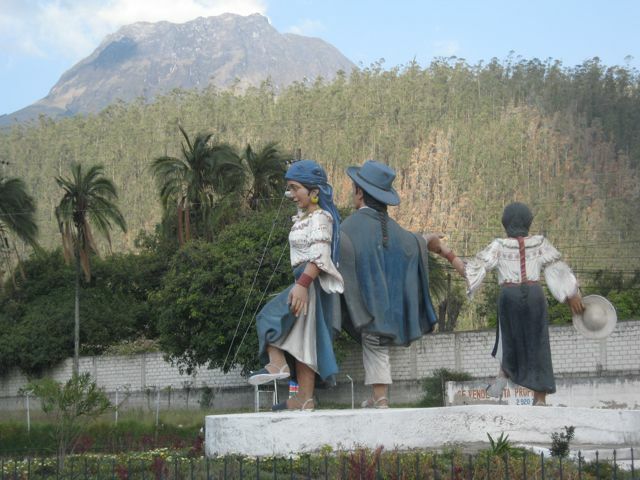 After being sick for nearly two days, we all felt well enough to travel, so Victor, Hugo, Marilyn, and I left for Otavalo at about 11:00 a.m. We took a scenic route part of the way and saw some really beautiful country. 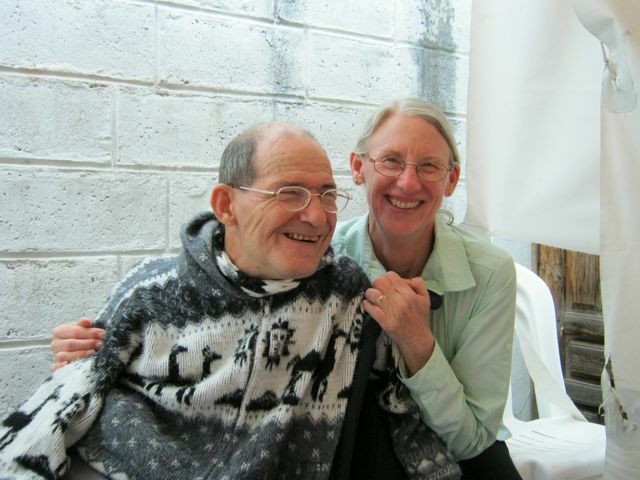 About two hours later, we arrived in Otavalo and had lunch at the Ally Micuy Hotel. We had stayed at this hotel when we participated in United Christian Church’s mission trip in 2008. Until we found an apartment, we’d stay here again. 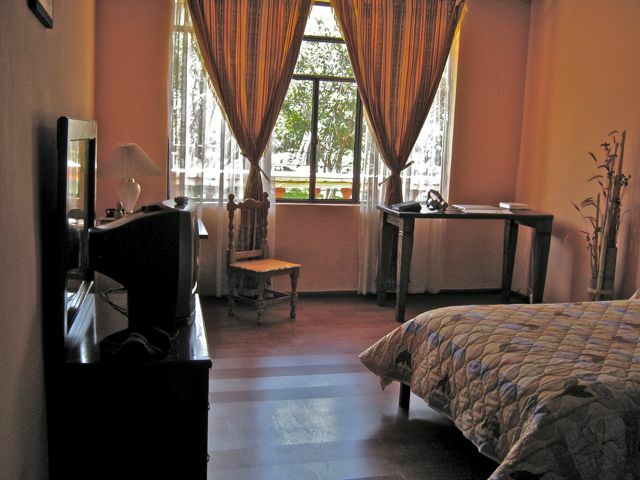 We met Isabel and Don Jairo, two of the principal employees of the hotel, and were shown to our room. It was exciting to see the many nice changes that had taken place since we had stayed at the hotel in 2008. We looked at one possible apartment with Hugo Jacamba right after lunch. Hugo was our bus driver on the 2008 mission trip and we all liked him very much. It was his apartment to rent. The apartment was on the outskirts of town, was new and very well decorated, had lots of storage space, had a big, modern kitchen that Marilyn would have absolutely loved, and the price was right. However, there were numerous steps, both inside and out. I couldn’t have gotten out of the apartment if there was a fire and I was alone. There was also no internet access in that neighborhood. Sadly, we had to pass. We would have liked to rent from Hugo and his wife. We picked up Isabel at the hotel, and she led us to someone else with an apartment to rent. This one was 10 minutes out of town, and actually a small house. It had a beautiful view of green-clad mountains, which I absolutely loved. So did Marilyn. The furniture was a bit uncomfortable, but we could buy new stuff if we had to. But I couldn’t get into the bathroom. Again, there was no internet access in the neighborhood. Again, the price was right. The view was so spectacular, though, that I thought about going to town once or twice a week to do the blog. We also looked at a few cars that afternoon, but found nothing suitable and within our price range. At dinner, Victor told us Marilyn’s Spanish wasn’t advanced enough for her to do the work he envisioned for her, which was primarily going into various communities to learn about problems they had that FEDICE could potentially help solve. Also, he hoped Marilyn could help to develop some Christian education programs with local protestant churches. He recommended she take a month and practice her Spanish with anyone she could. We were both concerned. It wasn’t about the month. It was that we had doubts for the first time about being able to truly contribute. Marilyn’s español would improve – of that there was no doubt. But would it improve enough for Marilyn to help do the work that needed to be done? We went to our room a little stressed that night. We weren’t sure we’d be able to contribute as much to FEDICE as we had envisioned. Our housing was unresolved. We had no car. We knew we weren’t going back home. If we stayed at the hotel all year, it would cost about twice as much as I thought Victor had quoted me. We had decisions to make. We decided: 1) to buy the car we had looked at in Quito if it was still available, 2) to take the house in the country only as a last resort because of its isolation, 3) to try to negotiate a more affordable price for staying full-time at the hotel for a year, and 4) to have Marilyn attend Spanish lessons at one of the language schools in Otavalo. We went to bed troubled, but slept well. At breakfast, Victor explained a little more about what he and Blanca envisioned as Marilyn’s job and it didn’t seem as daunting. Marilyn would eventually go into indigenous communities and talk with leaders about community problems and how FEDICE might help with those problems. She would basically be gathering information – after her Spanish improved. It was also hoped that she could help to develop a children’s Sunday school program. Christian education is not available in local indigenous churches at present. We drove to various places in the morning to gather maps and books about the area to study. We also stopped at a cabina (telephone booth) for two reasons: 1) so Marilyn could call the man with the car for sale in Quito, and 2) so she could learn to use the cabina if necessary. The man accepted our offer, which was somewhat lower than his asking price. Just before lunch, Victor arranged for us to stop at Isabel’s house (she had the day off). We needed to try to negotiate a lower monthly price for the hotel that would be more suitable to our budget. She was amenable to our offer, but said she would have to check with her boss. We didn’t really think she had the authority to make such a decision, but knew she was a good person with whom to start negotiations. There were some dates in July and August that the hotel was fully booked. It meant we’d probably have to move somewhere else during those times. This was an inconvenient, but workable problem. After lunch, Victor and Marilyn went to see about cell phones. They didn’t get one, but gathered the necessary information for us to take care of that chore on our own. They also checked on a driving school for Marilyn. 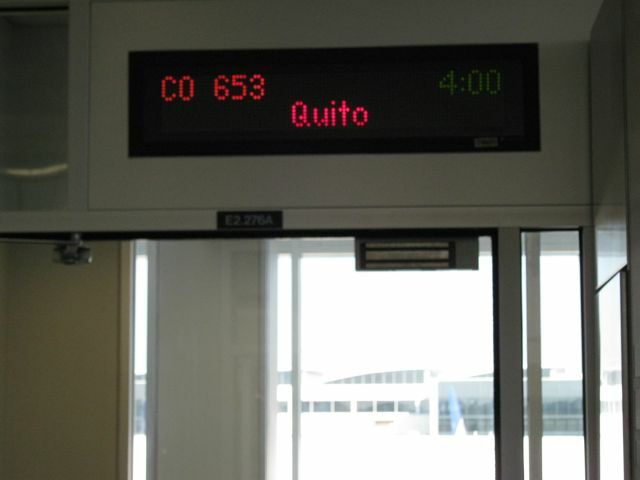 Victor then left for Quito. Marilyn went to sign up for driving lessons just before the school closed so she could start this month. But she needed something called a censo (an identification card), which we wouldn’t have until Marilyn could register our visas with the government. They also said she needed to first improve her español, as the driving classes were not in inglés. behind sculpture of folk dancers. We took a walk before cena (evening meal) just to look around. It was nice to finally be on our own schedule. This was a day of rest and acclimatization. Such a time is important when you fly from 60 feet above sea level to about 10,000 feet above sea level in five hours. I did nap quite a bit, as well as beginning a diary. Marilyn napped a little but also spent some time making friends with Victor’s dog, Laddie. He’s pretty rambunctious, which is why he’s on a chain. Also, he had a bad habit of trampling the flowerbeds when allowed to roam free. Marilyn decided she wanted to take Laddie for a walk around the yard, so she borrowed a thin leash from Maria (Victor’s domestic helper) that Maria uses for her dog. Before he was even off his chain, Laddie broke the leash Marilyn put on him. So, Laddie didn’t get his walk, and Marilyn owes Maria a leash. Probably just as well. Laddie would probably have dragged her down the hill! I must say, though, there were times when Marilyn exerted a surprisingly calming influence on him. 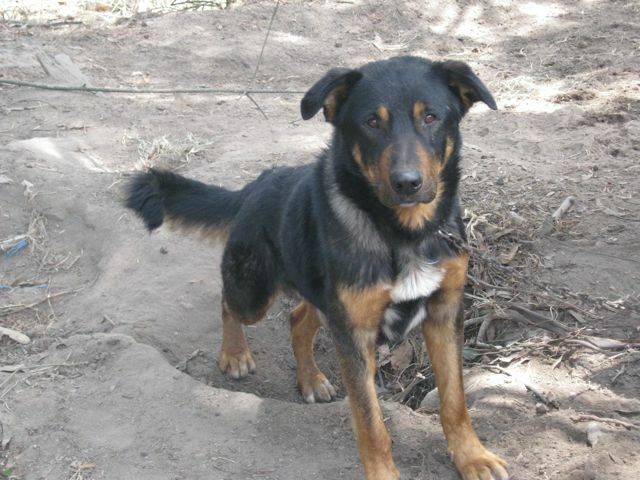 He’s smart, listens, and could be well trained if someone had time to work with him. The main event planned for today was a two year Memorial Service for Violet Vaca (Victor’s deceased wife). Tragically, she entered the hospital with a relatively minor ailment, caught a virulent infection there, and died within a few days. Victor has been very lonely without his wife of 43 years. We met Anita, Aldo, and Maria Helena (Victor’s sister-in-law), who were all board members of FEDICE. Blanca and Marlene (who works at FEDICE) were also there. During breakfast, Victor mentioned we’d be leaving for Otavalo tomorrow, and he would return alone. We were taken aback. I mean, we came down here to live by ourselves in Otavalo, but we somehow figured we’d be staying with Victor a few more days to get used to things and learn more about how FEDICE operates, since they are based in Quito. To be honest, we felt a little abandoned. But, we knew coming down to expect the unexpected. And this was one of those unexpected things. Marilyn felt sicker and sicker throughout the morning. She threw up just before we were to leave for Otavalo at 3:00 p.m., so we had to postpone our move. I was a little smug because I’m usually the one who gets sick when we travel south of the border. My smugness didn’t last long, though. I started getting sick about 10:00 p.m. – at both ends. I was sick all day, while Marilyn felt much better. Victor felt bad, too, so whatever it was did not only affect gringos. Blanca and Luis came and spent some time with all of us sickos. They brought over more medicine besides that which Victor had gotten for us. Someone Maria knew brought over a small blue van he wanted to sell, which meant I had to rise from my sickbed to look at it with Marilyn. (It was probably good for me, but I didn't think so at time.) Marilyn liked the van, but I wasn’t convinced it was what we needed, so I made a very low offer. Consequently, we didn’t come to terms. I stayed up a few hours, but then went back to bed. Oh, that felt good. Our apartment was at the bottom. We woke up at 6:00 a.m. and Marilyn had some last-minute cleaning and packing to do. Glenn didn’t think it was necessary, because he figured the Laurences wouldn’t mind doing any cleaning that she hadn’t gotten done. But he figured out that Marilyn was “paying it forward”, so we could return to a clean house in a year or so. We called Linda Zeccola, our ride to the airport, to make sure the previous day’s rare Pflugerville snowfall hadn’t adversely affected her. The number didn’t work, which made me somewhat uneasy. But, all along, our mantra had been, “What will be, will be,” or as Marilyn sometimes succinctly puts it, “Let go, and let God.” So, I really had no choice but to sit back and see what would happen. What happened was that Linda Zeccola showed up about 10:00 a.m., just as planned. As we drove by the farms, fields, and woods along Texas 130, I couldn’t help thinking it would be at least eight months before we saw them again. They were all brown and gray now, with green splashes provided by the cedars, but would soon be arrayed in wildflowers and their own particular shades of green. I knew I would miss that, though Ecuador is a beautiful country. 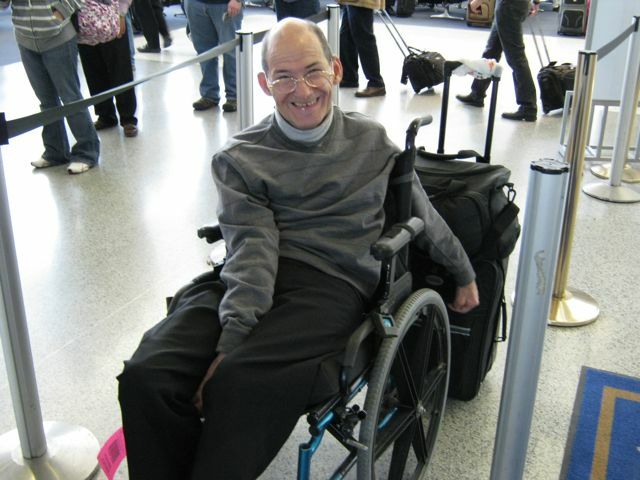 At the airport, we unloaded our considerable “stuff”, bid “Hasta luego” to Linda, and got a skycap to help us check in. During the long packing process over the past six weeks or so, we kept asking each other if we would be laughed at (or at least smiled upon) for thinking we had to bring so many of our “home comforts”. After all, we were supposed to be volunteering, not vacationing for a year in cushy comfort. We ended up with two duffel bags, a largish suitcase, a carry-on bordering on the line between checked and carry-on, my backpack stuffed to the gills, portable ramps, and a bag full of toiletries. We’d never traveled with that much before. We’re really doing this, right? There were two fairly unique reasons contributing to what we took. First, Marilyn is fairly tall at 5’ 10”, while the majority of women we had seen in the area where we’d be working were fairly short. Thus, unless Marilyn went to a major city like Quito to shop, she was afraid she wouldn’t find clothes to fit, especially pants. Second, we decided to take my portable ramps, which constitute a “bag” all by themselves. From previous experience, we knew that building entrances often have two to four steps and figured the portable ramps could come in handy. After checking in and going through security at the Austin airport (including the most thorough security check I’ve ever had), we had time to get something to eat, since we’d had a pretty skimpy breakfast. While eating, Marilyn called Linda Laurence to find out how her day was going. She and Darrell had taken the day off to start moving things into our house. They were already there - had gotten there before Linda Zeccola had gotten our van back - and were busily moving things in. We are very glad to have the Laurences staying in our house while we’re gone for a year. I, in particular, did not relish leaving our home empty for a year. Still, it felt strange to me to know they were moving in before our flight had even left Austin - kind of like having a party right after a friend had died. We wondered if they’d be sleeping there tonight. Last chance to abort the mission! In Houston, before boarding the flight to Quito, I told Marilyn this was our last chance to back out. She just smiled and slightly shook her head. We had both worked hard to make this moment possible. The adventure had begun, and no one was backing out now. Victor Vaca and Blanca Puma (founder and Executive Director of FEDICE, respectively) were there to welcome us with hugs, along with Luis (Blanca’s novio, or boyfriend) and Hugo (a son of Victor’s caretaker, Maria). Our luggage and my wheelchair pretty much filled the back of Victor’s pickup. Good thing he had two rows of seats for the rest of us. Are we crazy? I have asked myself that more than once. So far, the answer keeps coming back negative. We’re in good health. We love the Ecuadorian people. We can afford it. We’re both adventurous. If we’re ever going to do something like this, now seems like a very good time to do it. In preparation, Marilyn has taken (and aced) two semesters of Spanish at Austin Community College. Marilyn is the volunteer, here. I have made it clear that I'm going along to support her, though I'm aware I could get roped into some computer work. We also figure that I may be a decent role model for Ecuadorians with disabilities, especially since they don’t know what a real beast I am. We’re not entirely sure how Marilyn will help FEDICE at this point. It could be that she teaches rudimentary English. It could be that she helps with FEDICE’s community work. It could be that she helps organize a Sunday School program in various local churches. It could be she helps with groups who come down on mission trips. It could be some of all of the above. We’ll let you know as time goes on.